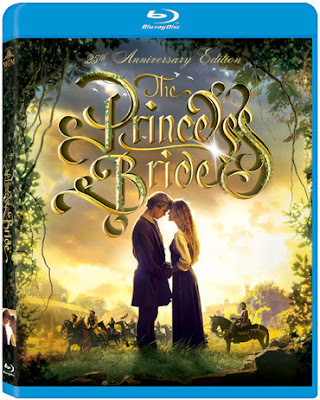 Scale the cliffs of insanity, battle rodents of unusual size, face torture in the pit of despair, and join Princess Buttercup and Westley on their spell-binding journey to find true love when The Princess Bride 25th Anniversary Blu-ray was released October 2nd from Twentieth Century Fox Home Entertainment. A classic fairy tale complete with heroes, villains, trickery, mockery and death-defying miracles, The Princess Bride captured audiences young and old with its brilliant, memorable dialogue, enchanting story line and bewitching characters. I had the opportunity to review, The Princess Bride on blu-ray. I absolutely love this movie. I've watched it several times as a kid and re-watching it on blu-ray was pretty awesome. The clarity and quality of the blu-ray was amazing and the story was just as good if not a lot better than I remembered watching it when I was a little girl. This is definitely a movie that I can watch over and over again and one that I plan on doing now that I have it in my collection. If you've ever watched this movie on TV or on VHS than you need to get this on blu-ray, you won't believe how great the picture is and how this movie is even better on blu-ray and if you've never seen this movie before I suggest you do, it's such a great love story that everyone needs to see. Disclosure: All opinions are my own. I received The Princess Bride at no cost for the purpose of this review. No other compensation was received.